“Don’t you realize that in a race everyone runs, but only one person gets the prize? So run to win! All athletes are disciplined in their training. They do it to win a prize that will fade away, but we do it for an eternal prize. So I run with purpose in every step. I am not just shadowboxing. I discipline my body like an athlete, training it to do what it should” (I Corinthians 9:24-27, NLT). In these verses the Apostle Paul explains that one’s salvation is not a single occurrence, a bi-monthly activity, or even a semi-annual event. It is a way of life that requires daily discipline and training. To illustrate how seriously the Corinthians must take the discipline of their salvation, Paul alludes to the Pan-Hellenic games held every two years in Corinth. Today, just as In Paul’s day, Olympic athletes endure extensive, rigorous training before competing. And athletes entering into a competition train to win! In the same way, self-discipline is needed for a person is to maintain both a healthy salvation and to achieve the eternal rewards promised by salvation. Too often we get engaged with all the activities of our lives, but we don’t get engaged with our salvation. Your salvation doesn’t just happen without giving it your time and attention. Once you have received it, it requires you to live it out with planning, purpose, and practice! So, be a practicing disciple. 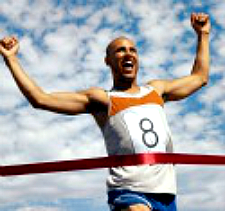 Approach your salvation like an athlete competing in a sporting event, not like a fan watching from the sidelines. And then, run to win! This entry was posted in discipleship, discipline, salvation and tagged Bible, discipleship, salvation. Bookmark the permalink.